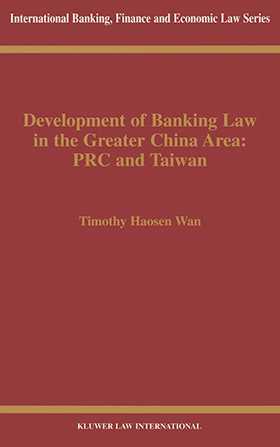 This volume covers the development of bank supervisory standards for an emerging Chinese Economic Circle (CEC) in which the People's Republic of China (PRC), Taiwan, and Hong Kong form an informal, interdependent relationship through their significant, increasing, inter-investment and inter-trade activities. The PRC, Taiwan, and Hong Kong are liberalising the regulation of their respective banking industries and are developing Shanghai, Taipei, and Hong Kong into major financial centres. To do this successfully requires the integration of prudential supervision (based on banking standards from the UK, United States, EU, and Basle Committee) into Chinese Banking Law and Practice. Bankers, banking lawyers, investors, and compliance officials will appreciate the way Development of Banking Law in the People's Republic of China and the Republic of China on Taiwan expertly brings together, in a single volume, the supervisory standards of PRC, Taiwan, and Hong Kong and offers unique, thoughtful solutions.